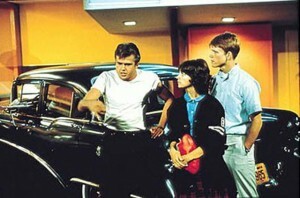 Paul Le Mat (l.), Cindy Williams and Ron Howard feel the night in their veins in American Graffiti. American Graffiti, the seminal 1973 coming-of-age film about one long summer night in the lives of four friends in San Rafael, Calif., made its high-definition debut as a Blu-ray Special Edition on May 31, 2011, from Universal Studios Home Entertainment. It also was reissued as a new Special Edition DVD . Written and directed by George Lucas (Star Wars) and produced by Francis Ford Coppola (Tetro), the movie provided breakout roles for a slew of future major stars, including Ron Howard (director of The Dilemma), Richard Dreyfuss (Piranha), Harrison Ford (Morning Glory), Cindy Williams (TV’s Laverne & Shirley), Mackenzie Phillips (TV’s One Day at a Time) and Suzanne Somers (TV’s Three’s Company). Filled with hot rods, memorable vignettes (mooning, anyone?) and a soundtrack of classic rock ’n’ roll featuring Buddy Holly, Chuck Berry, Bill Haley & The Comets and The Beach Boys, American Graffiti was a smash at the box office and has since gone on to earn more than $200 million in tickets revenue and home entertainment sales. Not bad for a film that cost less than $1 million to produce. The comedy has a simple story, following four friends one night in summer 1962 as they cruise the streets of their town before college, careers and uncertain futures take control. The highlight of the Blu-ray edition is a new video commentary by filmmaker Lucas that uses Universal’s branded “U-Control” technology. The DVD Special Edition includes a commentary by Lucas, as well as the “Making of American Graffiti” featurette that appeared on earlier DVD versions of the film. The movie is already available on Instant Video .